I'm designing a very simple circuit which contains a microcontroller, an LM386 and a speaker. The speaker is 4-Ohm (as I measure using a voltmeter). I don't know it's rating (I persume 1W) LM386 can provide (typically,according to it's datasheet) 325mW. so basically now I have 2.4v on 4 Ohm. what happens if I try to draw so much power from the LM386? will the signal be distorted? or simply less powerful? Am I doing the planning right? I mean, in order to draw 325mW I simply need to play around with the resistors until I drop about 1.3v on the speaker,is that correct? 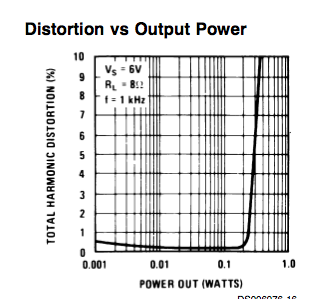 Filter the signal before the amplifier, not after it. If you overdrive the signal, it will be distorted. LM386 is good when you don't much care about audio quality or power or efficiency. If you do care about any of those things there are modern parts that do a lot better. Not the answer you're looking for? Browse other questions tagged audio amplifier speakers lm386 or ask your own question. home audio: How much current flows through my speaker amplifier's output?